Chaozhou wood carving is one of the folk carving crafts in China. Because after carving is completed, it is necessary to paste gold on its surface to show magnificent and exquisitely carved, so Chaozhou wood carving is also called â€œgolden wood carvingâ€ or â€œgolden paint wood carvingâ€. Gold-lacquered wood carving refers to the use of gold paint to apply the surface after the completion of the wood carving. Its advantages are old and not dirty. The bright but not fresh Chinese antique furniture has a long history of carving. During the long furniture production process, various schools of sculpture have gradually formed, such as the Soviet-style furniture school, the Beijing-style furniture school, the Cantonese-style furniture school, and Jin (Shanxi), Lu (Shandong), Ningbo (Ningbo), and Dai. (Fujian), Yang (Yangzhou) and other schools. These furniture schools have their own characteristics. They use their own local characteristics to jointly woven into the glorious furniture culture of the Chinese nation. The Chaozhou wood carvings in Cantonese-style furniture are uniquely distinguished by their unique artistic style. The Qing Dynasty reached its peak period Chaozhou wood carving was one of the folk carving techniques in China. It was named after Chaozhou, Guangdong. Because the genre has to be affixed with gold on the surface after the sculpture is finished, to show magnificent and exquisitely carved, Chaozhou wood carving is also called â€œgolden wood carvingâ€ or â€œgolden lacquer wood carvingâ€. Gold-lacquered wood carving refers to the use of gold paint after the completion of the wood carving, the advantages of which are old but not dirty, bright and fresh. Chaozhou woodcarving and Guangzhou woodcarving are two major schools of Guangdong woodcarvings, but the history of Chaozhou woodcarvings is also quite old. Historical materials show that Chaozhou woodcarvings can be traced back to the Tang and Song dynasties. Some of the wood carving building elements that existed in Chaozhou Kaiyuan Temple, the wooden fish that the monks used to open for food and the wooden dragon on the bronze bell were the remains of the Chaozhou wood carving in the Tang and Song dynasties. The Ming Dynasty was a brilliant period for the development of Chaozhou woodcarvings. According to records, the "Thousand Buddha Pagodas", a gold-lacquered wood carving created during this period, are very elegant and beautiful. The Buddha statues on each tower wall of the â€œThousand Buddha Pagodaâ€ are provided with Buddha statues, which are shaped like sitting or standing, solemn and dignified. What's amazing is that the relief on the tower, â€œThe Buddhist scriptures of Tang dynasty,â€ is unique in its conception, bright lines, and concise swordsmanship. It is an example of Chaozhou woodcarving in ancient times. Later, with the interpretation of history, with the arrival of the Qing Dynasty, with the introduction of Western culture, and the influx of European painting, architecture and sculpture art, it has had a positive impact on Chaozhou woodcarving, especially in the Qing Emperor Kangxi and Yongzheng. During the three dynasties of Qianlong and Qianlong, under the unremitting efforts and innovations of artisans of all ages, Chaozhou woodcarving reached its peak period, leaving many valuable artistic and cultural treasures for future generations. Three-dimensional carvings The most impressive contents of the Chaozhou woodcarvings are mostly from the human stories and historical myths that folks in the area like to see, as well as natural sights such as rare birds and animals and seasonal flowers and fruits, especially fish and crabs in aquatic animals. 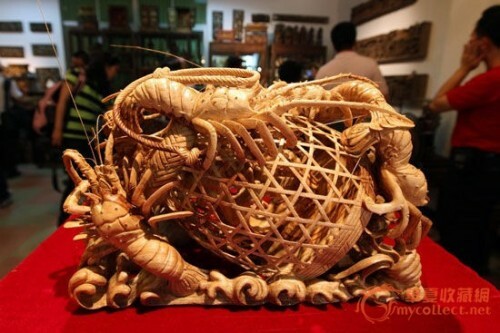 Shrimp, etc., which are similar to other topics such as Dongyang woodcarving, Huizhou woodcarving, etc., are similar, but also have regional characteristics. Therefore, this colorful display of Chaozhou woodcarvings and novel and unique decorative techniques embody the insight of ancient artisans on life and the ability to deliberately innovate and uniquely view. As for the traditional crafts of Chaozhou wood carving, it can be mainly divided into intaglio carving, relief carving, round carving, and enamel carving, but it is usually based on the combination of relief and enamel carving, and the most prominent and most commonly used technique is gong carving. And more for building components. The eagle carving, also known as "Tong carving", is hollow carving, which is a hollow carving technique that can express the theme of the content on multiple levels, that is, it develops from a single layer to a multi-layered skeleton. This technique can be divided into two kinds: three-dimensional and flat, among which the three-dimensional sculpture is the most exciting. It adopts a four-faced circular carving method. It has a clever structure and a vivid shape. Therefore, it has a large capacity and expressive force. It can often make the carved works lively, rich in levels, and strong in three-dimensional sense. Both fairy animals, rare birds and animals, and flowers and fruits of the four seasons can all have the artistic effects of both form and spirit. In general, the process of Chaozhou woodcarving is generally based on material selection, composition, rough cutting, rough carving, and finally the gold paint, resulting in a gold pattern on the red floor. The artistic effects make it appear magnificent and brilliant, and can give people a visual beauty of enjoyment. Chaozhou wood carving exquisite carving techniques and unique lacquer lacquer craftsmanship are used not only in cabinets, cabinets, and chests of architectural decoration and antique furniture, but also in many small objects such as shrines, mirrors, boxes, and fruits. Dishes and so on. In summary, Chaozhou woodcarving does have an extraordinary influence in the woodcarving arts garden in China. Although it cannot be compared with Dongyang woodcarvings and Huizhou woodcarvings that are widely known, their craft techniques still show many artistic charms to posterity.